Sarah reads from a piece of text. She seems to read well, only stumbling once in a while but nothing major that will affect her comprehension of the text. When she finishes the text, I ask her "What's it about?" She stares at me blankly. Bilal reads silently from his comprehension worksheet. When he's finished he starts answering the comprehension questions. I come over to check his answers. He gets some correct and some wrong answers, even the obvious questions that only requires the answers to be taken directly from the passage. I ask these children if they read at home and every single time, they would answer "no". Sarah and Bilal are not unique. There are many other children like them who can read but do not completely understand what they're reading. Parents, please get your child to read. The more books children read the better their comprehension will be because the more they read then the more reading skills they will develop. It makes sense that if you don't understand what you read then you start to ask questions or reread. Who would keep on reading something they don't understand? OK I know school children who don't like reading do because they have to read the text for school. The reason they don't understand is becaue they don't do a lot of reading for pleasure and so they have not developed reading comprehension skills. I remember I was never taught comprehension skills at school. The reason why I understand what I'm reading is because I was an avid reader. This is the same with my children. 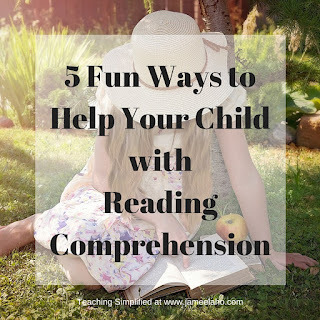 This article is not about the usual ways to help your child with comprehension - namely the skills to develop while reading, but it is more about the fun ways to get your child to read more. I will list the reading comprehension skills that your child will need below (these can be found in details here) so you'll get an idea of what they are. These skills will come more naturally when your child has a habit of reading regularly. I remember I was never taught comprehension skills at school. The reason why I understand what I'm reading is because I was an avid reader. This is the same with my children. We had developed advanced comprehension skills through regular reading. 1. Start early. Read to your child every day when he or she is little. This goes without saying! But I'll write it again: to get your child to love reading you must read to him when he's little. Start now if you have a young child. If your child loves to read then he'll be eager to read books by himself. And the more he read then the better his comprehension will be because he will have developed better reading comprehension skills. 2. Buy or borrow books your child loves to read. Just because your child only likes to read princess books doesn't mean that it will last forever. There are only so many princesses books in the world and she will soon reach the end of the supply. Your child will start to find other books to read. So for now keep buying or borrowing princess books (or whatever books your child is only reading). One day her reading taste will change. So it's better to have her read soemthing than not at all. 3. Have a family reading time. Just like at school where 10 - 15 minutes is set aside for reading only, such as in DEAR (Drop Everything And Read), you should do this at home. For the allocated 10 minutes everyone, including mum and dad and grandma and anyone else in the house, sits down and read. Not only will your child will have time to read but he will see you and other adults read. You will be modeling reading to him and when he sees you read he will more likely read as well. 4. Make reading fun. Watch the movie of books, go to dramatisations of books such as Disney on ice shows if your child is young, have a book party or a dress up as your favourite charater party. These parties aren't just for schools only, they can happen in your home! After these events, buy the book and read together to discuss similarities and differences. 5. Have a read aloud - Sit down together and each person can read a page or paragraph and discuss what's happening. You can even act it out. This will help your child to understand the text especially if you're modeling the six comprehension skills listed above. Remember to make it fun and not a skill drill.